This post-Labor Day Freebie has a bit of a crossover. 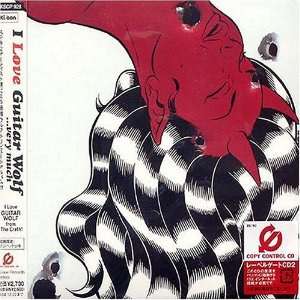 I Love Guitar Wolf very much is a tribute album to everyone’s favorite Jet-Rock’nRoll band featuring artists such as Jim O’Rourke; The Jon Spencer Blues Explosion; and The Wild Hearts. Also included is a hilarious cover of ‘Can-Nana Fever’ by Puffy AmiYumi. Pretty interesting since both are going to rock NYC very soon. This is brand new CD with your name on it! This FreebieGlorious is a bit more challenging – With your submission you’ll need to answer a question. If you’re a Guitar Wolf fan, it should be a ‘no brainer’. Simply sign the form below, and a winner will be selected and notified (via email) by Sunday September 12th. Please note, this giveaway is restricted to those located in the 48 lower United States.